~Schulz Sightings~: Meeting Drew Day 1~Enjoy! I flipped the blog and fixed the widths... the video was getting cut off. Hope that's okay! Wow!!! What a wonderful day! Thank you so much for sharing! Tears! You sure did not disappoint us blog followers. Satisfied! He is a treasure. Love the messy eating shots, so precious. Enjoy your son. Wow. I'm bawling and speechless. The joy on your faces is just beautiful. Thanks for sharing. (And GREAT JOB, Kristin!) Loved it! Ditto, the sobbing. What an amazing moment and beautifully captured! Glad to hear things are going smoothly. Praying for you all! just so beautiful. so, so beautiful. The gospel at its very best. Love. Redemption. Grace. Thank you for sharing this wonderful video/pictures with us. I am filled with joy for you and your family. You bring encouragement and hope to this waiting momma! He is just precious Emily! Congratulations! What an incredible blessing you are to this little child of God. Many blessings! Wow, I didn't think I would cry THAT much! So, so beautiful. We love him already and will continue praying for the trip. So thankful all is going well so far. Couldn't stop the tears! Beyond thrilled for you guys! What a handsome boy! Can't wait to meet him! Somedays I thought I would never see a video like this. Thank you so much for sharing it with all of us. Beautiful video! What a beaufitul family!!!!! I can't wait to show David, he will be excited to see Caroline in all the photos! Oh my word!!! 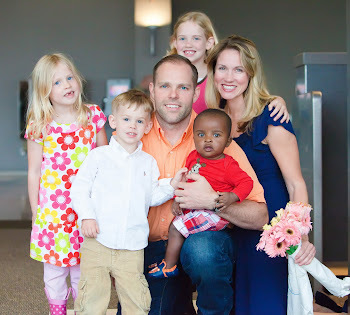 I love seeing people adopt from here, two of my favorite boys came from this orphanage (our friends two babies)! What a totally awesome blessing! We are so very excited for you and your family! How awesome! So happy for all of you! congratulations on your son!! The video was amazing. Praying for you guys as you're over there!